What surprised me about Italy was the emergence of something that felt like speranza, which I am told is the Italian word for hope. On my previous visits to Italy over the years, I have seen frustration, anger, and resignation – generally, there was a feeling that there was very little anyone could do to really change things. Even though the names and personalities and even governments changed, there was an underlying assumption behind every conversation that simply said, “This is the Italian way,” especially when it came to doing business. Government was slow and inept and bureaucratic; it took years or decades to get anything through the courts; and that’s just the way it was. Italians have displayed a marvelous aptitude for getting things done in spite of government, not because of it. So where is the hope coming from? 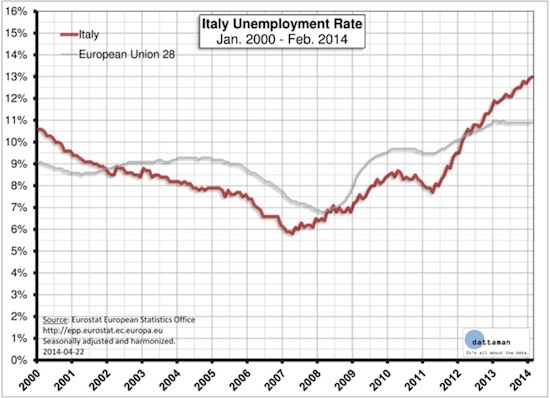 Renzi is not just going after the economic troubles. He seems to be attacking the very deep structural issues in a novel way. He is seeking serious constitutional reform in a country that has seen no constitutional changes for 30 years. Changing the constitution is difficult and requires a super-majority, which Renzi does not have. But when you meet with Parliament members and ministers from Renzi’s party, there is an optimism that is almost catching. Somehow or another Renzi has convinced a lot of people in the Italian political system that reform is possible. In particular, he wants to do away with the upper house (their senate) and streamline the decision-making process in the remaining house of Parliament, with different rules for creating majorities. Most of the political types we talked to were a little unusual from my perspective. Some very senior positions were not held by the usual career politicians but rather by former businessmen and bankers who had recently joined the government (in some cases returning to Italy to do so) in order to help bring about change. Something about Renzi just made them want to get involved. These guys were very successful in their former endeavors and brought a level of competency to their current projects. The optimistic goal in the bank of Italy’s projections is to get the primary surplus up to 4.2% in 2016, from 2.2% today. This bears a little explaining for most readers. You can find a very readable explanation here. Essentially it is the surplus or deficit in a government budget, not counting interest payments. A country is considered to have a “primary surplus” when it can cover all of its actual expenses other than the cost of paying the interest on its debt. What that technically means is that if you are willing to ignore (not pay back) your loans and interest, you can meet your other expenses. Economists and politicians seem to consider a primary surplus as a desirable condition, as opposed to merely being in a complete surplus. I spoke at a banking conference in Rome on Monday afternoon. I was the last speaker on a panel in which we were asked to address the question, “How will the markets react when monetary policy returns to normal?” My answer was that we are a long way from monetary policy in Europe approaching anything that one could call normal. I used the above chart and a similar one that depicts even worse dynamics for France. Countries with spiraling debt and a growth problem need a little inflation along with some growth in order to work out of their problems. And that is not an environment that calls for normal monetary policy. I generally followed up every optimistic meeting and presentation with two questions. The first dealt with the elephant in the room that nobody really wanted to talk about: “How do you deal with the rising debt and interest payments if you don’t get the growth and inflation you need?” Those of us with a little time under our belts remember the TV series Happy Days and the character Fonzie. Fonzie was almost incapable of saying the word sorry. In Italy I could not get anyone to say the words “debt restructure.” Sometimes they would look away or just ignore the question, but it was evidently a topic that was inappropriate in polite conversation. And then there was my second question. At the end of our presentation on Monday, I quickly dealt with my belief that France will be the next Greece. Unlike Italy, France is simply not dealing with its problems and seems to be in a state of denial. What happens when the market begins to demand higher interest rates from France and their debt becomes an even bigger problem? France has a much larger structural issue with their budget than Italy does and cannot handle nearly the debt load that Italy can. The euro, I maintained, is not so much a currency as an experiment, and will remain so until the Eurozone has dealt with the crisis that is going to ensue, starting in France. And if “the worst” is a restructuring of your debt after you’ve reformed your economy, then maybe that’s not so bad. Of course, there is the problem that Italians own 60% of their own debt. Their banks are loaded with Italian debt. So the word restructure is definitely laden. Which is why the Italians need a banking union. And it’s another reason why debt mutualization and the moving of some or all European debt to the balance sheet of the European Central Bank, in lieu of a classical restructuring and default such as happened in Greece, make a great deal of sense from the Italian point of view. I know my travel schedule always seems to change, but right now the calendar has me home for more than 12 out of the next 14 weeks. I can’t remember the last time that happened. I hope to be able to get into something like a routine at the gym and with work. I’ll be in Nantucket and New York City in the middle of July and Maine at the beginning of August. And there’s only one short trip so far in the middle of September. I’m sure September will change. The travel gods didn’t cooperate on the return trip from Rome. We got off a few hours late, eventually landing in Chicago. American Airlines conveniently put us on a flight later in the afternoon, but then there was a little weather problem in Dallas. So we sat in the Admirals Club as they moved the departure time back 20-30 minutes every half hour or so. Eventually we got out at about 3 AM and were finally able to leave the Dallas airport at around 5:30 – without our bags, of course. Rather than the full day I’d optimistically planned, I finally got to bed at 7:30 AM and slept most of the day. But eventually the luggage showed up, and by Friday morning all was right with the world. It was time once again to begin to write this letter. I pretty much finished it by Friday evening and decided I would get up early Saturday morning for one more read. Besides, I really did need to catch up on Game of Thrones. Everything was going according to plan until I sat down at my computer Saturday morning. Something, and our techies can’t figure out what, caused my computer to crash at 5:30 AM. And I stupidly had not saved my Word file. I know better than that. How many times have I told my kids that the first thing you do is title and save your document? Seriously. And for whatever reason, the crash happened so quickly that Word was not able to back itself up even into a temporary file. After trying everything I know, I got my tech consultants online to see if they could figure it out. Nothing. So there was nothing to do but to start over. Let that be a lesson to you, boys and girls. Always save your work – early and often. Thinking back on Italy, one of the more interesting parts of the tour last Sunday through Rome was visiting the Church of St. Ignazio. It is an early Jesuit cathedral, evidently built before they had all the money in the world. As they were getting to the end of construction, they ran out of dough before they could build the dome. In stepped Brother Andrea Pozzo, an enterprising priest who said, “You want a dome? I’ll give you a dome.” Unfortunately he was not an architect but an artist. So rather than building a dome he painted one. And so we have one of the most remarkable pieces of perspective art anywhere in the world. From the center of the church looking upward, you see this perfectly shaped oval dome structure, full of marvelous paintings and lighting. Except that when you walk around under the “dome,” you clearly start to see that you aren’t looking at a real dome at all, but a painted picture of a dome. I walked back and forth several times trying to come to terms with the fabulous grasp of perspective that it took to be able to create such a massive architectural artwork. Let’s close this letter with a little bit of idle speculation. At the end of the day, I wonder whether France, when confronted with a crisis as I think they will be, will really elect National Front leader Marine Le Pen and let her take them out of the Eurozone. While there may be a complete rejection of the Socialist Party after the miserable performance Hollande is giving, could not the right conservative take second place in the first election and then win in the final? And who might that be? It will be interesting to see what Christine Lagarde does after a few more years as head of the IMF. Silly speculation, I know. But isn’t European politics fun? July 6, 2014, 10:53 a.m. Allow me to agree with Roger Wiegley. In Italy whatever effort in whatever field routinely has obstacles thrown in its way by some embodiment of the Left. Take Pompei, for example. In the past few years quite a lot has been done to spruce it up and make it more tourist-friendly and efficient. The Grand Theater, which had been confiscated by court ruling four years ago, has just be re-opened for performances. So you would think the trade unions would be happy that things work and can afford prospects for making money and then hiring more people, right? No, they slammed Pompei with five days of protests. Not strikes, but workers’ assembly meetings and the like which do not entail any sum being detracted from their pay. With no prior notice, which meant that 500 tourists showed up at 8:30 in the morning, normal opening time, waited for two hours under the sun and only then were told there would be no opening time for 5 days. Thousands of tourists will have gone home to confirm that Italy is a land of unbearable chaos. Do the unions care? I suspect not. I suspect that this is the desired effect: it is sabotage, willed by the heads who take decisions like these. Not Italians, but leftists who happen to be Italian. July 4, 2014, 7:43 a.m. Thank you for taking the time to shine a little light on my country, ever ignored by the media, to whom the big countries are ONLY Northern Europe plus Spain, whose economy is actually way behind Italy’s. May I add a little perspective in this regard? Not to change the end figures but just the respective reliability and reputation, which is such a big factor in today’s economy, especially from the point of view of the American merit-oriented mindset. Overlooked, for example, is the fact that Italy has been helping debtor countries out, throughout the crisis years, to the tune of billions of euros, yet finds itself painted in the media as being a spendthrift recipient of bailouts? Normally ignored in the general press, except to confirm uninformed clichés about things like the mafia and corruption, Italy started being described in the financial press as a basket case, hovering on the verge of disaster due to the size of its public debt, at the beginning of 2011. Despite its (then still) humming industries, mostly healthy banks and debt-free, educated, well-to-do population – conditions that are more than enough to guarantee secure payment of a country’s sovereign bonds - the press portrayed Italy’s condition as being desperate and placed the blame on the shoulders of the nation as a whole. In actual fact, the situation was only desperate because of an uninformed international press pretending it is informed while choosing its sources only from among the “progressive” liberal press that mirrors their own biases. And the blame should actually be laid where it belongs, for example at the door of the decades-long unreasonable demands and manipulations of domineering communist parties and trade unions with a finger in every pie: a tale of warning that bears out the Cloward-Piven strategy of instigating the downfall of a capitalist society by overwhelming the system with massive demands. It could be a useful read for the U.S. before it finds itself winding up in the same spot. Up until the single euro currency was invented, Germany was the “sick man of Europe”, mainly due to the fact that Western Germany had absorbed impoverished and backward Eastern Germany (Prussia) in one swallow, sharing with it the strong Deutschmark as its currency, with no adjustment. The Germans are still having to pay a tax for the support of ex-East Germany, but the common currency has enabled them to spread the burden onto all of the other members of the EU as well. And since the introduction of the euro in 2001 German exports have soared, and every year there has been a surplus in Germany’s accounts and a consequential mirror-image deficit in the accounts of the rest of the euro-zone countries. There are many little details that have favored the image of Germany presented to the world as the most prosperous, honest, solid, upright and reliable country in the EU, or maybe the world. Things like the liabilities from the Kreditanstaltfurwiederaufbau which they don’t include in the official accounts, so that they don’t come to bear on the total debt. Or the covert bailout they received when, as revealed by Bloomberg, Germany was allowed to spread its exposure to Greece onto all of the other EU countries. Most outrageous of all: the arms deals foisted on Greece, which in order to gain Germany’s assent to the bailouts was bullied into handing over a sizeable amount of said bailouts back to Germany itself, settling its debts for a purchase of submarines! SO WHO IS BAILING OUT WHOM? In order to bail other countries out, Italy has had to borrow money itself, at double the interest paid back to us! Does this get us credit in the eyes of the financial world, or any world at that? No, this has added dramatically to our notorious public debt, thereby giving the last bashes to our already pesky credit rating. And the final dab of irony is that at the same time praise is heaped on the borrower countries for their newly shining performance. Well done, Spain and Portugal, you managed to pay back the EU loans. But what about us, on the lending side? Where is the helpful pat on the back in widely read international newspaper headlines? Bailouts are carried out in order to help a country’s creditors as much as the country itself. This is particularly obvious in the case of Greece, which Germany and France cynically compelled to use a considerable part of its bailout money (borrowed from the EU, at interest) to pay off previous purchases of German submarines and French helicopters. Percentage-wise, with respect to its exposure to Greek debt, Italy has contributed more than any other country to Greece’s bailout. But while the Greek government was forced to pay for German submarines (at least one of which doesn’t even stand up straight), as well as for French helicopters, it neatly rescinded its contract for Italian fighter planes, with no penalty attached . Of the total €340 billion granted to Greece in official loans, only about 15 billion came directly from Germany, which corresponds to only 68.6% of Germany’s exposure in terms of the Greek bonds held by its banks. France, also imperilled by a possible Greek default, has contributed an even smaller proportion: 21% of its exposure. Conversely, Italy which, having relatively few Greek bonds, was one of the countries least at risk, has forked out 214.6% or more than double its exposure. - money we must borrow at any interest the marketplace allows us, often even 6-7%, while getting some 3% interest in return. - money that contributes to increasing not only the recipient countries’ debt, but also our own debt, for which we are fined by Brussels and reported on as profligate spenders!! The Press: Conniving or Incompetent? So which country do you think is being trumpeted by the international press as being the one and only magnanimous and put-upon benefactor of all things European? Italy, which is shouldering a share of the bailout which is wildly disproportionate to its exposure? Of course not. As always these days, when something is being meted out to enhance reputation and/or the economy, Germany is on the receiving end. I would love to dwell on this as well but I won’t tax your patience any longer than I already have. Thanks for reading. June 30, 2014, 7:18 a.m.
John, I believe I read you are using Office 365 now….you should open docs and start new ones from your OneDrive so that they are automatically saved to he cloud rather than facing lost work from computer crashes. June 29, 2014, 3:47 p.m. 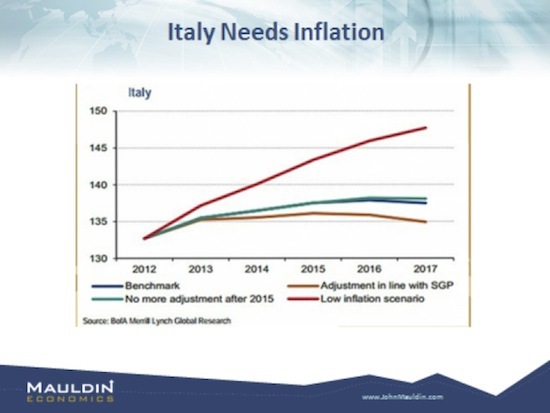 I think that Italy needs GDP growth but not inflation to reduce it’s deficits and debts. Inflation will cause interest rates to rise, thereby increasing interest expenses for the government. The government will also have to provide higher transfer payments to keep those who need them up with inflation and the government will have to pay higher costs for the goods and services it purchases. Since Italian debt is denominated in Euros, it will have to be payed back in Euros. Making things cost more in Euros for Italians will not decrease the value of the Euro and the debt denominated in it. It will just leave Italians with less money left over to pay for discretionary purchases, thereby reducing growth even more. June 23, 2014, 10:02 p.m.
June 23, 2014, 9:35 a.m. I have been reading your latest email on Italy. And I like the tone of the piece: here are the pieces that are needed; here are the alternatives if one or two pieces are missing. Let me try to summarize, then make a suggestion. 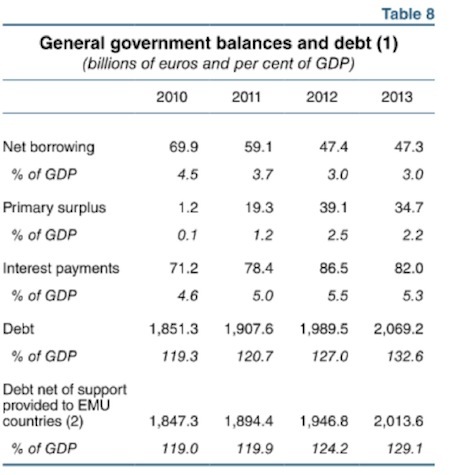 If I understand correctly, Italy has debt equal to 133% of GDP and interest per year of 5.3% of GDP. After paying interest, debt increases at a yearly rate of 3% of GDP. Looking out over the next 4 years, if all else remains the same, Italy will add 13% compounded to GDP, to get to 146%, a dangerous level. However, as you point out, one element of any plan of recovery for Italy (or France) would be a restructuring of debt. Using the Italian numbers, about 60% of the debt is held by Italian individuals or institutions. If we were to request a 20% haircut to take Italian debt from 133% to 107%, interest would be reduced to 4% of GDP, not much of a reduction. Furthermore, those who hold the other 40% may not want to take a haircut, as we saw with Greece. Indeed, central banks won’t take any reduction in face value. In this scenario, the debt will grow back to 124% in four years. However, if everyone agrees that the collateral can stay at 100%, one could achieve the same net reduction another way. By declaring that all of the Italian reforms depend upon a bank holiday for 4 years, here is what you would achieve. Debt would be reduced by 2.3% of GDP per year or 10% over 4 years. Debt would stand at 123% of GDP at the end of 4 years, or 1% lower than the result achieved taking a 20% haircut. This would be especially true if the haircut did not apply to 20% or so of debt. Widows and pensioners who hold Italian debt might be hurt; but tax rebates could be used with surgical precision to help those in need. Further, if an interest holiday were declared for 4 years, investment might be more inclined to come into Italy. Investors love certainty, and they love curves that work in their favor, not against them. The problem with the Italian formula for success, as I think both of us see it, is that the world economy will not support a plan that is premised on a higher level of exports. So, we get to my second thought. 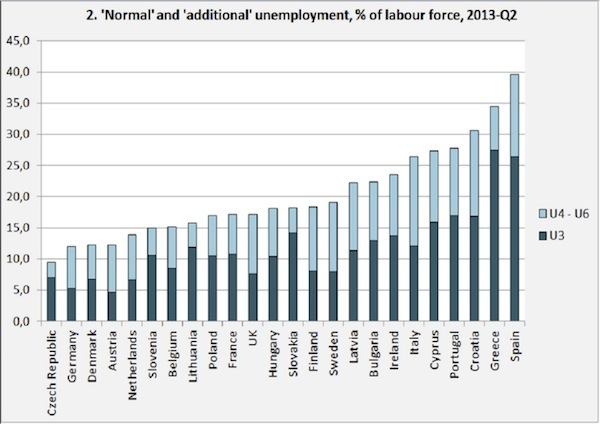 If Germany outsources a large percentage of their manufacturing labor to Poland and still has a low level of domestic unemployment, perhaps we have a model that will support outsourcing in Italy. Obviously, Germany understands that by outsourcing some labor, German companies stay competitive and win new business. This model for manufacturing then provides labor inside Germany for running the business (G&A), marketing and sales, final assembly, packaging and shipping, etc. Second, the services that accompany both Polish manufacturing labor (in Poland) and German assembly labor (in Germany) push up total employment in both countries. Apply this model to Italy and its ability to outsource to Slovenia, Croatia, Serbia, Hungary, Romania, etc. As we Americans might say, perhaps this would be a win/win. I am going to keep this short in the hopes that you will read it while recuperating. June 22, 2014, 10:33 p.m. The world is currently running out of resources, fossil fuel, water, minerals, energy and so on. The cost of obtaining resources for expansion of an economy, especially one like Italys, requires energy and raw materials which the country does not have. The question is how can Italy grow with these high front end costs without finding somewhere else to cut costs in order to be competitive? In fact, the question is a global one, whether the world can grow at a 2% plus rate in an era of dwindling resources. Some thought needs to be given to the possibility that without major revisions to the way we use our remaining resources we may be faced globally with declining growth, with the inability of the current economic system to grow in one place without contracting somewhere else. June 22, 2014, 5:30 p.m. Your optimism knows no bounds. Structural reform will not solve Italy’s problems if the architect is a “left center” politician. It is the left-center politicians, dominant over the past 60 years, who have led us to where we are, not just in Italy but in all the developed countries. (The Soviet Union being the archetype.) The idea that higher taxes (because it allows “fair” redistribution), more regulation (because it benefits all of us) and bigger government (because politicians know how to solve problems and improve conditions) is not just fundamentally flawed, it is a death spiral. And to suggest that inflation, which is nothing more than currency devaluation, is a solution to anything, is simply ludicrous. I cannot believe you drank the cool-aid. June 22, 2014, 4:07 p.m.
I’m surprised at your minimizing Renzi’s CV as mayor of Florence “rubbing shoulders with the likes of Barack Obama.” Obama, as far as I am aware, had no bona fides when he ran for US president other than community organizer in Chicago, which may explain why he is currently adrift in the post of US prez. Italians are a nation of emigrants. They go where the work is, which makes them unusual among the “developed” part of Europe. I come from a long line of emigrants. My great-grandfathers and grandfathers emigrated to America in the nineteenth and early twentieth century, prepared to go to Argentina or France if the US hadn’t accepted them, and 40 years ago, I emigrated the other way, trying my luck with other countries, from Australia, to Brazil and Peru, South Africa and finally back to Europe. But the trick was, we were always prepared to work, and in jobs other people considered beneath them. Government—and not just in Italy but everywhere you went—was an obstacle to be overcome, not a cash cow to be milked. My ancestors came from towns and cities that are 2,000-3,000 years old. We will be around 3,000 years from now. Will America?